This article is about the year 1916. For the album by Motörhead, see 1916 (album). Year 1916 (MCMXVI) was a leap year starting on Saturday (link will display the full calendar) of the Gregorian calendar and a leap year starting on Friday of the 13-day-slower Julian calendar. The Royal Army Medical Corps first successful blood transfusion using blood that had been stored and cooled. January 13 – WWI: The Battle of Wadi occurs between Allied British and Ottoman Empire forces, during the Mesopotamian campaign in modern-day Iraq. In Browning, Montana, the temperature drops from +6.7°C to -48.8°C (44°F to -56°F) in one day, the greatest change ever on record for a 24-hour period. Brushaber v. Union Pacific Railroad: The Supreme Court of the United States upholds the national income tax. January 29 – WWI: Paris is bombed by German zeppelins for the first time. February 9 – 6.00 p.m. – Tristan Tzara "founds" the art movement Dadaism (according to Hans Arp). Emma Goldman is arrested for lecturing on birth control. The Baltimore Symphony Orchestra presents its first concert. The Romanian football club Sportul Studenţesc is founded. February 21 – WWI: The Battle of Verdun begins in France. March 1 – Liberal British Columbia Premier Harlan Carey Brewster's term in office ends. March 8–March 9 – Mexican Revolution: Pancho Villa leads about 500 Mexican raiders in an attack against Columbus, New Mexico, killing 12 U.S. soldiers. A garrison of the U.S. 13th Cavalry Regiment fights back and drives them away. March 15 – President Woodrow Wilson sends 12,000 United States troops over the U.S.-Mexico border to pursue Pancho Villa; the 13th Cavalry regiment enters Mexican territory. Mexican Revolution: The U.S. 7th and 10th Cavalry regiments under John J. Pershing cross the border to join the hunt for Villa. The SS Sussex is torpedoed, resulting in the Sussex pledge. John Ronald Reuel Tolkien marries Edith Bratt (they would serve as the inspiration for the fictional characters Lúthien and Beren). 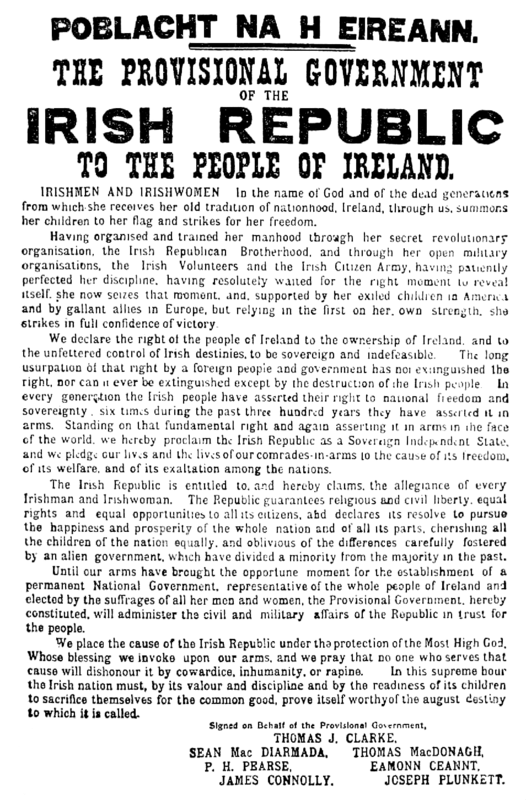 The Proclamation of the Irish Republic which was distributed during the Easter Rising. April – The light switch is invented by William J. Newton and Morris Goldberg. April 20 – The Chicago Cubs play their first game at Weeghman Park (currently Wrigley Field), defeating the Cincinnati Reds 7–6 in 11 innings. April 22 – The Chinese steamer ship Hsin Yu capsizes off the Chinese coast; at least 1,000 are killed. 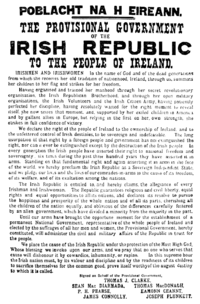 April 24–April 30 – The Easter Rising occurs in Ireland. April 27 – WWI – Battle of Hulluch: The 47th Brigade, 16th Irish Division is decimated in one of the most heavily concentrated German gas attacks of the war. May 5 – United States Marines invade the Dominican Republic. May 16 – Britain and France conclude the secret Sykes-Picot Agreement, which is to divide Arab areas of the Ottoman Empire, following the conclusion of WWI, into French and British spheres of influence. May 20 – The Saturday Evening Post publishes its first cover with a Norman Rockwell painting (Boy with Baby Carriage). May 21 – Britain initiates daylight saving time. May 22 – The case of United States v. Forty Barrels and Twenty Kegs of Coca-Cola is decided. May 31 – June 1 – Battle of Jutland: The Royal Navy and the German Navy battle to a draw. June 4 – The Brusilov Offensive, the height of Russian operations in WWI, begins with their breaking through Austro-Hungarian lines. Louis Brandeis is sworn in as a Justice of the United States Supreme Court. The HMS Hampshire sinks off the Orkney Islands, Scotland, with Lord Kitchener aboard. July 1 – November 18 – WWI – More than 1 million soldiers die during the Battle of the Somme, including 60,000 casualties for the British Commonwealth on the first day. July 1 – July 12: At least one shark mauls 5 swimmers along 80 miles (130 km) of New Jersey coastline during the Jersey Shore shark attacks of 1916, resulting in 4 deaths and the survival of one youth who requires limb amputation. This event is the inspiration for author Peter Benchley, over half a century later, to write Jaws. July 2 – Battle of Erzincan: Russian forces defeat troops of the Ottoman Empire in Armenia. July 8 – July 16- Massive flooding caused by 2 different hurricanes devastates western North Carolina. July 15 – In Seattle, Washington, William Boeing incorporates Pacific Aero Products (later renamed Boeing). July 22 – In San Francisco, California, a bomb explodes on Market Street during a Preparedness Day parade, killing 10 injuring 40 (Warren Billings and Tom Mooney are later wrongly convicted of it). July 29 – In Ontario, Canada, a lightning strike ignites a forest fire that destroys the towns of Cochrane and Matheson, killing 233. July 30 – German agents cause the Black Tom explosion in Jersey City, New Jersey, an act of sabotage destroying an ammunition depot and killing at least 7 people. August 7 – WWI: Portugal joins the Allies. August 9 – Lassen Volcanic National Park is established in California. August 25 – U.S. President Woodrow Wilson signs legislation creating the National Park Service. August 29 – The United States passes the Philippine Autonomy Act. September – Bulgaria takes Dobruja from Romania. September 2 – British pilot William Leefe-Robinson becomes the first to shoot down a German airship over Britain. September 5 – Release of D. W. Griffith's film Intolerance: Love's Struggle Through the Ages in the US. September 11 – A mechanical failure causes the central span of the Quebec Bridge, a cantilever-type structure, to crash into the Saint Lawrence River, killing 13 workers. September 13 – Mary, a circus elephant, is hanged in the town of Erwin, Tennessee for killing her handler, Walter "Red" Eldridge. September 27 – Iyasu V of Ethiopia is deposed in a palace coup, in favour of his aunt Zauditu. Troops from New Zealand during WWI. October 12 – Hipólito Yrigoyen is elected President of Argentina. October 14 – Perm State University is founded in Russia. October 16 – Margaret Sanger opens the first U.S. birth control clinic - a forerunner of Planned Parenthood. October 21 – Friedrich Adler shoots Karl von Stürgkh, Prime Minister of Austria. October 27 – Battle of Segale: Negus Mikael of Wollo, marching on the Ethiopian capital in support of his son Emperor Iyasu, is defeated by Fitawrari Habte Giyorgis, securing the throne for Empress Zauditu. November 1 – Paul Miliukov delivers the famous "stupidity or treason" speech in the Russian State Duma, precipitating the downfall of the Boris Stürmer government. The Kingdom of Poland is proclaimed by a joint act of the emperors of Germany and Austria. Honan Chapel, Cork, Ireland, a product of the Irish Arts & Crafts Movement (1894–1925), is dedicated. U.S. presidential election, 1916: Democratic President Woodrow Wilson narrowly defeats Republican Charles E. Hughes. Republican Jeannette Rankin of Montana becomes the first woman elected to the United States House of Representatives. November 13 – Prime Minister of Australia Billy Hughes is expelled from the Labor Party over his support for conscription. November 18 – WWI – Battle of the Somme: In France, British Expeditionary Force commander Douglas Haig calls off the battle, which started on July 1. Britannic sinks in the Kea Channel. 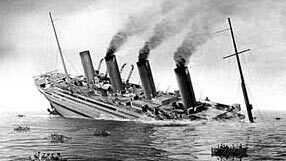 November 21 – The White Star Liner HMHS Britannic, sister ship of the RMS Olympic and the legendary RMS Titanic, sinks in the Mediterranean Sea after hitting a mine. 30 lives are lost. November 23 – WWI – Eastern Front: Bucharest, the capital of Romania, is occupied by troops of the Central Powers. December 12 – In the Dolomites, an avalanche buries 18,000 Austrian and Italian soldiers. December 17 – Grigori Rasputin is murdered. December 22 – The British Sopwith Camel aircraft makes its maiden flight. It was designed to counter the German's Fokker aircraft. December 23 – WWI – Battle of Magdhaba: In the Sinai desert, Australian and New Zealand mounted troops capture the Turkish garrison. December 30 – Humberto Gómez and his mercenaries seize Arauca in Colombia and declare the Republic of Arauca. He proceeds to pillage the region before fleeing to Venezuela. December 31 – The Hampton Terrace Hotel in North Augusta, South Carolina, one of the largest and most luxurious hotels in the nation at the time, burns to the ground. Oxycodone, a narcotic painkiller closely related to codeine is first synthesized in Germany. Rodeo's first side-delivery bucking chute is designed and made by the Bascom boys (Raymond, Mel, Earl) and their father John W. Bascom at Welling, Alberta Canada. Cours de linguistique générale by Ferdinand de Saussure is published. The Summer Olympic Games in Berlin, Germany, are cancelled. Food is rationed in Germany. Ernst Rüdin publishes his initial results on the genetics of schizophrenia. The Netherlands is hit by a North Sea storm that floods the lowlands and kills 10,000 people. Robert Baden-Powell founds the Wolf Cubs Scouts in Britain, changed to Cub Scouts in the USA. Louis Enricht claims he has a substitute for gasoline. Gustav Holst composes The Planets, Opus 32. Bray Studios creates the Farmer Al Falfa series, the first of the Terrytoons. The Society of Motion Picture and Television Engineers is founded in the United States. The Enrico Parodi sinks while in tow off The Carracks in Cornwall, England. In the 1941 film Citizen Kane, Charles Foster Kane runs for New York governor and loses. Also in 1916, Emily Monroe Norton divorces him and, in either this year or in 1917, he marries Susan Alexander. Jack Manning, American film, stage and television actor (d.2009). This page uses content from the English language Wikipedia. The original content was at 1916. The list of authors can be seen in the page history. As with this Familypedia wiki, the content of Wikipedia is available under the Creative Commons License. 136 people were married in 1916. There were 1 military battles in 1916.